Born in Hertfordshire, Alison studied at the Guildhall School of Music and Drama and at the Paris Conservatoire, graduating in 2001 with 1st Class Honours and the Principals Prize. 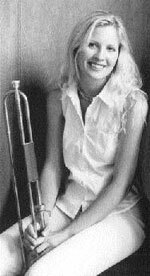 Alison then became the first brass player ever to be selected for representation by Young Concert Artists Trust, London. She has studied with Håkan Hardenberger and John Wallace. Notable among the many prizes and awards Alison has won are the brass final of the BBC Young Musicians Competition in 1998 and the Premier Prix for the ‘Most Beautiful Sound’ at the Maurice André International Trumpet Competition 2000 in Paris. Alison has appeared at the BBC Proms at the Royal Albert Hall with the Australian Chamber Orchestra, and has appeared as soloist with the Philharmonia Orchestra, Bournemouth Symphony Orchestra, the Ensemble Orchestral de Paris and the Ulster Orchestra and with smaller ensembles such as the Guildhall String Ensemble and The Parley of Instruments. Alison has also worked with the London Symphony Orchestra, the London Philharmonic Orchestra, the Wallace Collection and London Brass. As a recital artist she has performed at Wigmore Hall, Purcell Room and the Barbican Hall in London, and the Bridgewater Hall in Manchester, as well as venues in New York, the United Arab Emirates, Columbia and throughout Europe.